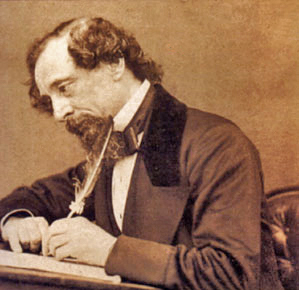 Throwback Thursday: Charles Dickens, Spy Novelist – The Bookshelf of Emily J. This post was originally published on January 12, 2012. Reading Dickens pleases my husband. He has no idea that the first line of A Tale of Two Cities is, “It was the best of times, it was the worst of times,” yet I could detect his pleasure at seeing me sprawled out on the couch with that heavy volume balanced on my stomach (281). He bought that volume of four novels for me. It’s one of those leather-bound books with gold edges from Barnes and Noble. Each Christmas, my husband gives me one or two of these coveted books. This year, he bought five of them after paying close attention to a conversation I had with a neighbor about all of the leather books on our shelves. This neighbor quizzed me on my top five favorite books – Angle of Repose by Wallace Stegner, The Picture of Dorian Gray by Oscar Wilde, Dracula by Bram Stoker, anything by William Shakespeare, and Willa Cather’s My Antonia. However, A Tree Grows in Brooklyn by Betty Smith or Mama Day by Gloria Naylor could easily be on that list depending on my mood. And then, while Darnay is being removed from the prison unconscious, the scene changes to Miss Pross, who whips out her ninja skills and defeats Madame Defarge in a cat fight any boy at my high school would have paid to see! (Once I witnessed a fight in which one girl ripped the other’s shirt and bra off, but she kept on swinging with one arm while she covered herself with the other!) Miss Pross engages Madame Defarge to protect Lucie, who is fleeing France. The best line: “‘You might, from your appearance, be the wife of Lucifer,’ said Miss Pross, in her breathing. ‘Nevertheless, you shall not get the better of me. I am an Englishwoman’” (501). Well, you can’t argue with that! Miss Pross continues talking to keep Madame Defarge guessing over Lucie’s whereabouts as long as she can. When that gets old, the two women engage in a hand-to-hand battle. Miss Pross handily defeats the knitting monster by shooting Madame Defarge with her own gun. I love hearing about her experience as a teenager in reading it. It is tough to get into but I’m glad the ending won her over as it did me. Good for her for sticking with it. Particularly love “The Picture of Dorian Gray,” and if you haven’t seen the movie — it’s old — it’s well worth the time. What a responsive hubby you have, Emily. Who was the woman who was Dicken’s muse? I think there was a movie about her/him. Dickens is the author I’ve been meaning to pick up for years. This makes me want to get to him sooner rather than later. Thanks! I am happy this prompted you to move him up your list. See Kay’s comment for even better info on where to start. Hi, Emily, I don’t know if you have tried any more Dickens, but I think A Tale of Two Cities is one of his worst novels, although one of his shortest (the only historical one). Try David Copperfield. It is very entertaining. A lot of people consider Great Expectations to be his best, but I prefer some of the others. I’ve read Oliver Twist and it was just okay for me. I need to look into the ones you suggest. Sounds like I have even better treats ahead of me! Yes, I would call Oliver Twist just okay. Oh wow! That is fascinating. Not surprising given its cultural power in those first lines. I wonder how many of those copies were actually read! This might sound crazy, but I’ve never been convinced to read A Tale of Two Cities, especially due to the mixed reviews on whether it’s the worth the read or not—but you’ve really captured the spirit of it in a few select scenes that really appeal to me! Thanks for opening my eyes to a great book. I’ll definitely be picking it up on my way home today. I hope you enjoy it. There are some dry parts but the ending is action-packed and exciting. Let me know if I was wrong! If I can survive the dry chapters of Dorian Gray, I’m fairly confident I can get through this too. Thanks! I read this last year, and really enjoyed it. Even in such a depressing topic, there was a lot of humour. I’ve read three books by Dickens and have liked all of them, but Bleak House is my favourite so far. I really need to read Bleak House. I keep hearing such good things about it. Thanks for the nudge! I fell in love with Dickens when I read Oliver Twist for the first time. He was an amazing writer who really stands the test of time. Agreed! Dickens will never go out of style. I never liked Tale of Two Cities, despite having tried to read it numerous times. I love most of Dickens (D. Copperfield and Great Expectations being my faves.) But a few months ago you raved about Tess of the D’Urbervilles, which I had hated in high school. So I got a copy and am re-reading it, and loving it. Who knew?! I think that reading classics takes a bit of knowledge of the times in which they were written—certainly more knowledge than a high school kid has—to understand it all, and get the jokes and the pathos, and even the story line. But it seems that I’ve somehow absorbed enought knowledge about Victorian times that Tess makes sense to me. So I will give TToC another shot. Thanks. No problem! I love what you are saying about time and experience making a difference. I had a similar experience with The Grapes of Wrath. It is silly to expect kids to understand everything about a classic novel or to appreciate it as much as we can once we have lived a little longer. I hope you enjoy a reread of TToC! That’s funny, because I loved Grapes of Wrath. But maybe because my mom and grandparents had lived that life during the depression (without the Rose of Sharon ending) I felt closer to it. However, they hated that book. They always said Steinbeck made the dispossessed look like trash. A Tree Grows in Brooklyn. A classic I loved and the enduring pure beauty of love of young girl. I cannot remember the name of the song but the artist admonished listeners for breaking young girl’s hearts. Or guard your heart All meaningful and sadly used. I love that book! Maybe it is time for me to reread that one. I recommend it to everybody. Oh yes and I think a good idea too for dads because it reveals a lot that matters. Thanks Emily. I have read “A Tale of Two Cities” as a teenager. But I think it was an abridged version. I wonder why? At that age I should have been reading the original, and my parents actively discouraged any abridged versions from being brought in over the threshold. I have never been a fan of Dickens, but now, you have inspired me to read it. 🙂 Clever reference to Jack Bauer, that! Thanks. Reblogged this on whedonfreak976 . A classic book. Oh I need to go back and read some of his work. Me too. I think more Dickens is in order!